Indonesia is a big country, consisting of many cultures with many musical traditions. The biggest culture, with the most highly refined musical tradition, is that of the Javanese. The island of Bali also supports a distinct classical tradition. The music of other cultures has also been recorded, but I will not be dealing with that, as it has more the character of folk art. Since many readers are apparently less familiar with the Javanese cultural setting (as opposed to India, China or Iran), I will discuss this background before proceeding to the list of recordings. The language we call Javanese is spoken in the central and eastern parts of the island of Java. The western part is Sundanese (from which there are also a few recordings, not to be discussed). Javanese is a very complicated language, consisting of three distinct vocabularies and grammars to be used with those in superior, equal, or inferior social positions with respect to the speaker. The national language of Indonesia is a modern construction, designed for simplicity and easy use by the wide array of different cultures within its boundaries. Prior to the European period, Javanese was the dominant culture of the region, at times holding hegemony in parts of the Asian mainland. For instance, in the early-medieval history of what is now Cambodia, a restoration of the traditional monarchy was heralded by the arrival of a prince from Java to take the kingship. During the Mongol era, a large invasion fleet (much larger than that sent to Japan) was sent to Java, only to be soundly thrashed at sea, without a landing. This will give the reader some idea of the Javanese strength, but it should also be noted that this hegemony was generally not expressed through military means (at least insofar as we understand it), but rather as cultural and trading superiority. Of course, this situation was drastically modified by the arrival of the Arab traders. Indonesia is counted as the most populous Muslim nation in the world, but this is somewhat misleading. Islam is not a "state religion" as it is in many Islamic countries, and there is quite a bit of variety, although the majority of inhabitants do profess Islamic beliefs. Among the larger cultures, North Sumatra is the "most" Muslim; in fact, it was home to a major Islamic University (known, for instance, in China) during the later medieval era. Java is also Islamic, in the sense that the people believe in many of the tenets of Islam and identify themselves as Muslims, but there are also other simultaneous belief systems. Prior to Islam, Java was alternately Hindu and Buddhist (and Bali remains Hindu), and these beliefs continue to be important for Muslim people. There is also an older layer of native religious practice which is still alive and well. Javanese religion is termed "syncretistic" (i.e., combining various influences), and it is generally only our tendency to give priority to the monotheistic religions which yields the Javanese the designation of "Islamic" per se. Of course, the influence of Islam should not be understated either. The gamelan orchestra, based on metallic percussion with some wooden xylophones and drums, is well-known to many readers. In various forms, it is ubiquitous to Southeast Asia. 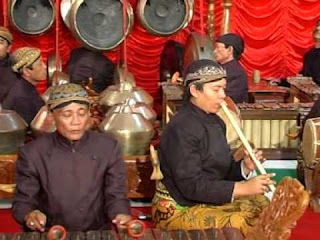 In Java, the full gamelan also adds a bowed-string instrument (the rebab, a name illustrative of Islamic influence), a bamboo flute (suling) and voices. The rebab is one of the main melodic instruments, together with the bronze xylophone "gender," and is often played by the senior musician to lead the ensemble. Voices consist of male (and sometimes female) choruses called gerong, together with female soloists called pesindhen. However, the voices are not used as "lead" instruments in court gamelan (as opposed to wayang kulit, shadow puppet theater) and blend with or complement the sound. More specifically, the chorus is very much a part of the texture, whereas the soloist has an almost-separate improvisatory role, including the use of notes outside of the mode of the piece. In these abstract pieces, mostly "gendhing" on the current list, the words are largely secondary to the music. 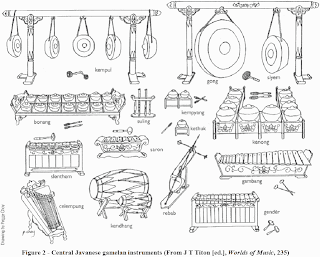 This list of recordings is devoted to court gamelan. There are four royal courts (kratons) in Central Java, two each in Surakarta (Solo) and Yogyakarta. Returning briefly to history... when the Dutch took over the Southeast Asian trade and established themselves in Java (Sunda, actually), their policy was not to destroy the royal court, but to isolate it. In other words, they did everything they could to remove any political influence from the sultans, but allowed the court to remain as a cultural institution (which had always been a large part of its role, perhaps analogous to the Chinese Emperor). Much later, the court (originally in Solo) divided into four, due to philosophical differences (of aesthetic) in the royal house, and with encouragement from the Dutch. The kratons continue to serve as cultural and educational institutions, and house the classical music tradition of Java. Each court has a huge roster of musicians and an extensive collection of historical instruments. Today many of these musicians also have jobs outside their kraton, but this was not true in the recent past. Despite what any of this discussion might imply, the music itself is extremely coherent. It shows no sign of mixed objectives, but is rather a "pure" style. The repertory is vast. There are two scales in Javanese gamelan music, "slendro" (pentatonic) and "pelog" (heptatonic-pentatonic). Tuning is not standard, rather each gamelan set will have a distinctive tuning. A complete gamelan consists of a pair of sets, one tuned in each of the scales and intended to be played together in many instances. 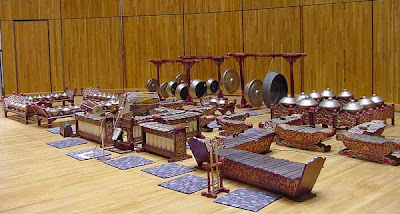 Different gamelan sets have different sonorities, and are used for different pieces of music; many are very old, and used for only one specific piece. Musical forms are defined by the rhythmic cycles. These consist of major cycles subdivided by smaller cycles, each marked by the striking of successively smaller gongs. The melodic interplay takes place within this framework (technically called "colotomic"). There are also distinct melodic modes ("pathet") within the division of scale, three for each of the scales. The modes are defined according to which notes of the scale are emphasized, much like the vadi/samvadi concept in Indian classical music.